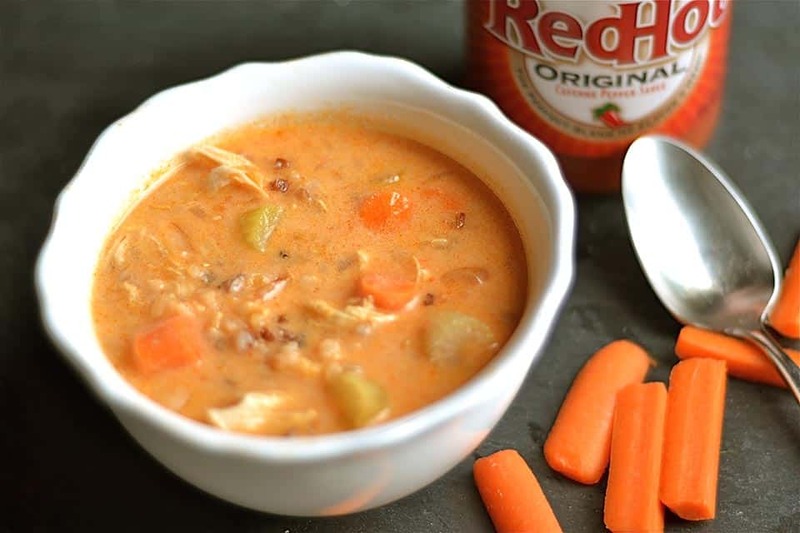 All the taste of buffalo chicken wings in a lightened-up healthy and hearty soup! This simple slow cooker chowder is perfect for a chilly fall/winter day, and makes a great dish to enjoy during football season! Buffalo wing sauce is quite delicious to me; one of my favorite condiments! I am girl who loves tang, some spice, plenty of flavor, and buffalo sauce combines all of this. 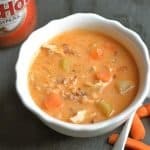 As someone who loves the sauce, but not the wings, this soup is great way to to combine the best of both worlds. Sure to be a favorite among the football chicken-wing-loving family members in your house! So let’s also talk about how easy this soup is. 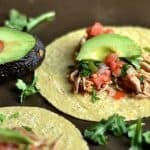 Dump everything in the slow cooker, and forget about it!! WOOOHOOO!!!! 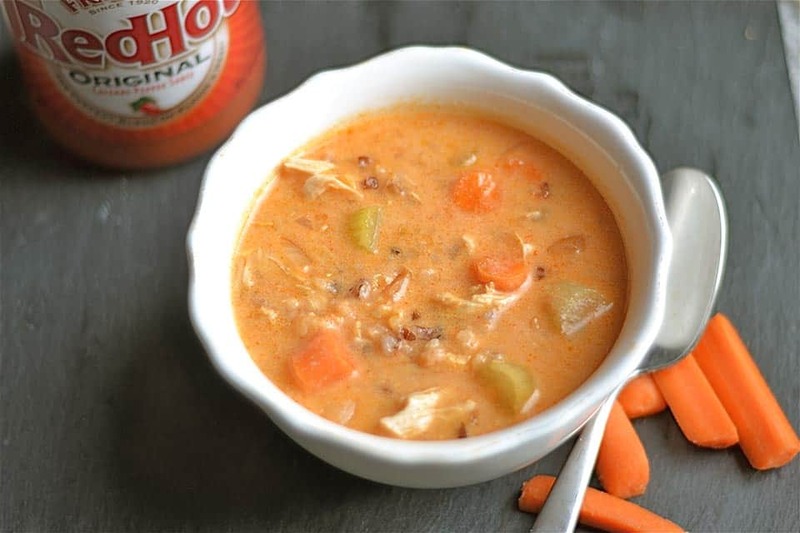 Total win-win on busy weeknights, or makes a great main dish for a football party or tailgate. You can pay more attention to your company, and less attention to cooking. I did add a Wild Rice Blend from Trader Joe’s to the soup. You can use any wild rice or a basmati, jasmine, or even quinoa. A regular brown rice might not cook properly in this soup, but I haven’t tried to give it a thumbs up or down. 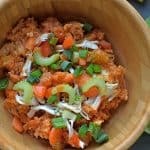 I love the texture that the rice adds to this dish, but you can also omit the rice altogether and just enjoy the simplicity with veggies. The final addition to this soup is some half and half. You will add it to the end, right before serving. This gives the soup just the right amount of creaminess! Serve immediately, and maybe even add some cheddar or blue cheese to the top. Enjoy! 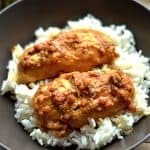 Place chicken in the bottom of your slow cooker. Add rice, vegetables, and top with broth and buffalo sauce. 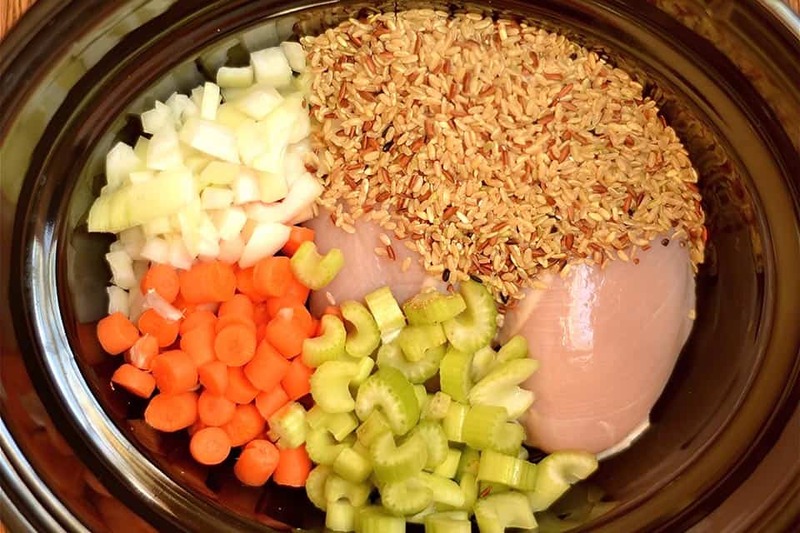 Set your slow cooker to low and cook for 4-6 hours, or until chicken can be easily shredded and rice is cooked through. Shred the chicken, add the half and half, and stir to combine. Serve immediately. Optional (but tasty) to add some shredded cheddar or blue cheese crumbles. I use the Trader Joe's California Wild Rice Blend, but any wild rice, basmati, jasmine, or even quinoa will work for this recipe. Would lentils work instead of wild rice, or will they “take over” the flavor? I’ve never had lentils before that I can recall. Sure! But they will soak up more of the broth, so you may need to add more chicken stock. So, I made this with the pre-cooked lentils from the refrigerated veggie section at Trader Joe’s, and it was great! I added them about an hour before the soup was done cooking. I also used the mirepoix from TJ’s as my diced onion, carrot, and celery, which saved time on chopping big time. 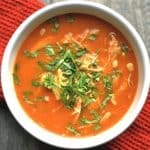 I’ll definitely be making this again – my husband wouldn’t let me share the soup with anyone else he liked it so much! A few of my girlfriends came over last night to help make bridal shower favors for our friend’s wedding. I wanted to make dinner since everyone was coming after work. I also accidentally purchased bone-in chicken breast and shredded it, removing the bones, after. I also didn’t use that much half and half. It was so delicious, and the consistency came out more like a chili (probably because of my chicken mishap). The girls loved it and were so pleased that it is actually healthy! Can you substitute a dairy free option for the half and half? I made this for a soup party and everyone LOVED it!!! Made it the day before so the rice and everything soaked up a lot of the liquid so it wasn’t too liquidy (if that’s a word lol) but still soupy enough! I left the half and half out because I was afraid to add it. Considering everyone loved it without the half and half I’m sure it would’ve been just as good, if not better, with the half and half. I wanted to make something different and this was a big hit…got lots of compliments! Also super easy to make. Definitely keeping this recipe and using it more in the future!! Delicious!! Thank you!! So glad you loved it!! One of my faves too! Would rotisserie chicken work as well? What would that do to the cook time? Yes, you can use rotisserie chicken. I would still use the same cook time!